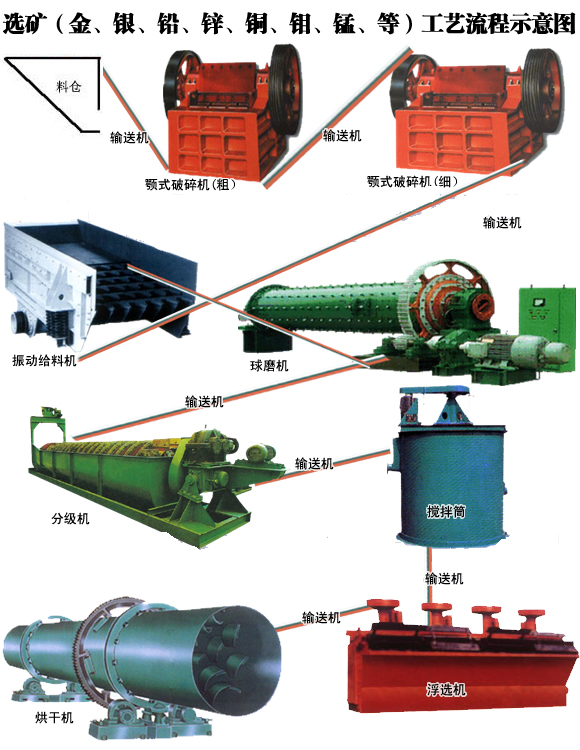 The mian method of molybdenum ore beneficiation is flotation. The recovery molybdenum is molybdenite. Sometimes in order to improve quality of molybdenum concentrate and to remove impurities, molybdenum concentrate is dealt by chemical beneficiation once again. Molybdenite crystals has six-layered or plate-type structure which is formed by paradigm of health along the inter-layer S-MO-S structure and the layer of polar covalent bond S-MO. The binding among layers is weak, but covalent bond binding inner the layer is strong. So molybdenite is easy solution fissure along structural layer to show sheet or plate. This is the reason that digenite has well floatability in nature. Practice has proved that with suitable grinding fineness, Molybdenite crystals dissociat in S-Mo-S layer and the hydrophilic S-Mo takes up little area. But through mill, the area ratio increases, and floatability reduces. Although at this time to add some quantity of polarity collector such as xanthate, which is benefit for the recovery of molybdenite, new slime, caused during mill, affects flotation results. So molybdenite of sorting should avoid and prevent grinding. In the production, we should take the process of sub-ore grinding and multi-stage sorting to achieve monomer dissociation and to make sure high recovery rate of molybdenum.